California is taking the initiative to change the way state testing is done and make it more specialized to each student. California’s school chief proposed a change to the way STAR testing is done in all California schools. This would consist of multiple changes, such as switching to less multiple-choice questions and using computers to specialize student’s tests. 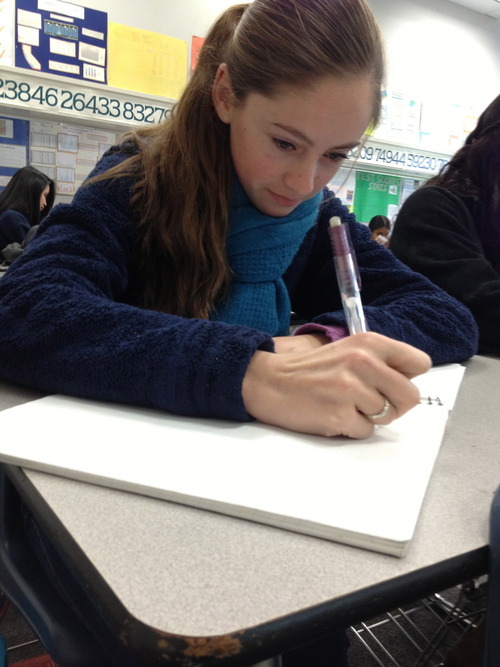 Kaitlyn Kelly taking notes in class. “If new specialized tests were created, they would be more beneficial for schools trying to assess a student’s knowledge,” said sophomore Anna Shutovska. To specialize the tests, the computers would check the answers as the student goes along and choose harder or easier questions depending on how well the student does. These tests would show the student’s level of achievement rather than just showing if they passed a certain standard. Although this would measure how well students are the learning standards, many students would not like this change because they are used to the ease of the STAR test. “I think the STAR test is really easy, but I’m fine with it because I don’t have to worry about my scores,” said freshman Alex Wildman. On the other hand, students like that are frustrated with how easy STAR testing is. They would prefer to show what they’ve learned and have a point the the standards that teachers follow all year. Something that may hinder schools into putting this program into effect is the cost of it. Overall, this would cost California $1 billion to implement and would change the curriculum and standards for teaching greatly. Testing in this fashion will also help bring standardized testing into the twenty-first century. Schools would eventually be required to use computers to administer these tests. Another change that this could effect is the High School Exit Exam that is required for all students to pass to graduate. Officials are looking at getting rid of it entirely and using these new standardized state tests to decide whether students should be allowed to graduate from high school, rather than use the CAHSEE. Although this testing would not go into effect until the 2014-2015 school year if passed, this change may help students.